FAU baseball took No. 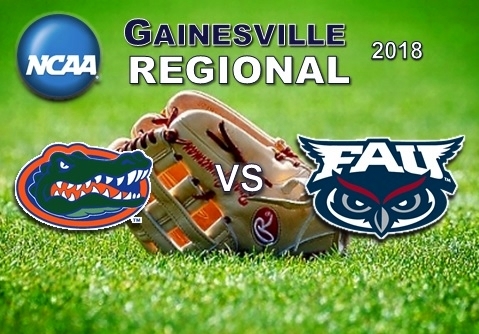 1 Florida to its limits, forcing a seventh Gainesville Regional game with a 7-4 win on Monday before falling in the decisive matchup, 5-2 early Tuesday morning, to wrap the team’s 2018 season. After securing the first victory Monday, the two teams were right back at it 45 minutes later, and it took FAU (43-19-1) just a handful of minutes more to take the early lead. Three of the first four Owls walked, and a Gunnar Lambert bloop single to left made it a 2-0 lead. UF (45-18) got one in in the third, but were held off from getting more when Jordan Poore induced a flyout and knocked down a comeback liner to keep the tying run at third. The next inning though, the Gators would take the lead, on a two-run home run by Jonah Girand. UF added two more on back-to-back solo home runs in the fifth, which would end the night’s scoring. Not that FAU didn’t have opportunities, with runners on in every inning past the third, but couldn’t break through again against any of the three Gator pitchers. Likewise, Drew Peden pulled a rabbit out of his hat for the final time in his FAU career, getting out of a bases-loaded, no-out jam in the eighth. He struck out Jonathan India, made an acrobatic play (with Kevin Abraham stretching at the plate) to get the lead runner on a dribbler, and struck out Austin Langworthy as well. The Owls forced the conclusive matchup on the strength of a five-run third inning earlier Monday. Miranda knocked in two in the frame with a single, Rivera followed with one as well, and Joe Montes got two too. The last FAU runs came the next inning on a Montes sac fly and Jared DeSantolo single. The lead held up on the combined pitching efforts of Zach Schneider, Clemente and Peden. Schneider, in his first start of the season, allowed just six hits and three runs, and five strikeouts, in five innings and exactly 100 pitches. Clemente struck out a batter and gave way to Peden, who closed it out, getting the save with 3 2/3 innings of nearly-flawless ball. A ninth-inning homer was the only blemish against him, and he had four more K’s. The 43 wins by the squad is the most since 47 in 2004 and is the most is McCormack's 10 years atop the program. Following the game, the Owls placed five on the All-Regional team: Frank, Miranda, Wilson, DeSantolo and Peden. "These days are never easy, but I just want to thank the players for what they did today and did all year," said Head Coach John McCormack. "Unbelievable group of guys. They played their butts off all day today, all year, so proud of them. Made my job easy. Made all the stuff that goes into being a head coach, made it real easy … (They) understand what it is to put on the uniform, have the opportunity to play a great game in college baseball, and again I just want to thank them for everything they've done." Additionally on Monday, Frank became the latest FAU player to join the professional baseball ranks, as a second round draft choice of the Tampa Bay Rays, No. 56 overall. FAUSports.com will have more on his selection on Tuesday.